Floyd Archives - Scientific Ink . My cat’s name is Floyd, and the reason I want to tell you about him is that my experience with him parallels a little bit my experience in Siddha Yoga. It’s a story of purring to share increasing comfort and joy. Close to 15 years ago, we adopted a stray cat. We were walking into the door of my apartment building, and a cat started calling to us. He came to us from across the little street, meowing the whole time. He was scrawny and bald in places where he plucked out his fur in response to flea bites. He looked ragged, and he was really hungry. He seemed sweet, not feral at all, and I brought him inside. He seemed to understand living with humans. He was hungry. He fattened up and his hair grew in and he remained a talker. He also had a very soft, very subtle purr. I recall being surprised by a cat with such a loud and demanding voice had such a tiny purr. Well, the other day I realized in an affectionate moment, that he has a much louder purr than I remembered when we first met. His purr is more fervent now. I think that over time, as his comfort level and his trust have deepened, and so has his purr. When he purrs, he draws me in. His purr expresses happiness and prompts me to give him more affection so that he’ll continue to purr. I did a little research on why cats purr. It was interesting. Cats purr as kittens when nursing, when receiving affection from us humans, and they purr sometimes when they are sick or scared. So, cats purr for communication, and depending how you interpret why ill cats purr, it is either for self-soothing or maybe healing. According to an article in Scientific American, the frequency of the vibration of the purring actually may help bone density and healing. Well, you might wonder where I’m going with this. As I thought about all of this, I thought about my own experience with Siddha Yoga and how I have opened up like he has, how tuning into his purring and the practices and has helped me enjoy life so much more. I showed up the doorstep of the Siddha Yoga Meditation Center just like that stray kitty, hungry for knowledge, hungry for peace of mind. I was restless, looking for something. I had always known I wanted to meditate. I tried a local class, and I ended up frustrated and sore from the sitting positions or asanas and no closer to the peace of mind I was seeking. At one point, I shared this urge with my scientific mentor. It turned out she also had a meditation practice and a community, this one, and she invited me to accompany her to a satsang one Thursday night. I arrived at the Siddha Yoga Meditation Center in Ann Arbor in late spring in 1998, right after the death of my father. That night, like most Thursday night satsangs, we chanted and sat for meditation. It was the chanting that caught me. I was struck by how the chant started solemnly. In those slow early verses, I experienced a lot of the sadness I was carrying around. But then, something magical happened, the chant sped up, and I found myself carried along with its momentum, and the end was fast and joyful and fun. And I had the experience of going along that entire arc. And I had the sense that by giving myself to the chant that I would be soothed, met in sadness and brought to joy. And I had the sense that when I was singing solemnly, I felt solemn. When I was singing joyfully, I experienced joy. I had thought it was the other way around, but acting in those ways drew forth that experience, drew forth that same energy from the world around me. I also found, as I still do, that the chants continued to give to me, sticking with me as melodies or words or just that lovely well being that I experience in the chant. The words or melody would popping back up in quiet moments, reminding me, reconnecting me to the experience, to joy. So, chanting was like my purring. It was and still is a form of self soothing, but it is also a practice of expressing and of cultivating joy, and drawing it to me and sharing it with others. It’s the time of year when everything is bursting open – while my tulips have faded, the redbud in the back has finally decided (after several years of skipping flowering and going straight to leaf, just to spite us) that it is, in fact, a redbud. We’re thrilled it has deigned to bloom in our backyard, joining a host of other redbuds planted throughout the city. The neighborhood’s Forsythia are greening up now, after their show of yellow flowers. And, perhaps the best of all, the lilac just over the fence from our deck has gone crazy with blooms. We have a cat, and the cat lives for being outside in the summer time, especially in the evenings. In a moment of weakness, I let him outside this evening. This means that I have been outside calling for him several times, one time I spotted him under the car in the driveway and he moved out of sight to snub my attentions. Cats! Likely it will take a few more trips to the deck to call into the night to convince him to join me inside. Well, at least tonight the dizzying scent of the neighbor’s lilacs are rewarding me for each otherwise fruitless visit to the back deck to call a cat who hears me and chooses not to listen. I have a special relationship with this lilac. It lives on the other side of the fence, but bends its boughs into the sunlight on our side too, and I’ve set my compost pile at its feet, nourishing it quite accidentally, because it is close to the kitchen door. So. perhaps I share just a small bit of responsibility for its the frothy blooms and the fragrance. Now if only I could get my cat inside, all would be about perfect. What a glorious sunshiney day. 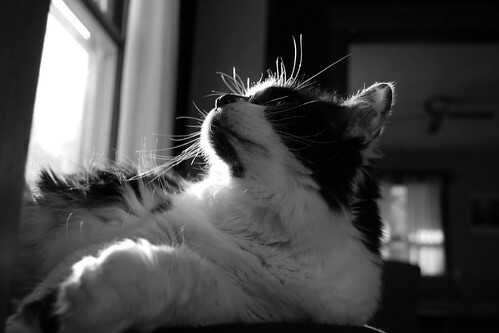 My semi-elderly cat is soaking up the rays, moving from chair to chair in the dining room as the sliver of sunshine arcs across the room. He’s loving the sunshine too, flipping over now and then to “brown the other side”. This past week my husband was overseas on business. He’s back now, I’m grateful for his safe return and the chocolate he brought, of course, but I’m also grateful for the time apart. 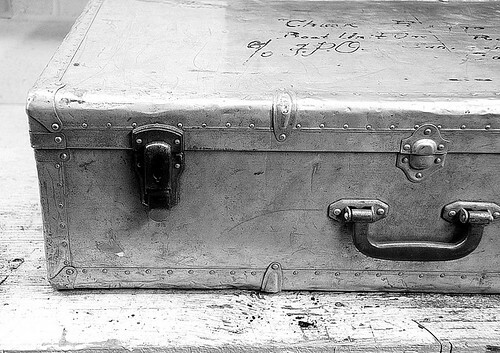 A Sailor’s Suitcase, originally uploaded by Bob AuBuchon. I am grateful for the little pleasures of having the house to myself: sleeping diagonally across in the bed, using his pillow/invading his space, having the cat all to myself, for my clock dictating my schedule. I’m grateful for takeout food: Jerusalem Garden, Eastern Flame, Zingerman’s Roadhouse, Washtenaw Dairy. I’m grateful for modern technology that means I can get his cell phone in Europe by dialing a local number. I’m grateful for the time difference: when I was upset and couldn’t sleep and it was 2AM and there was no one here to talk to, I was able to reach him in his morning in Europe. Not for long, but for a moment, and it was good. I’m grateful because absence makes the heart grow fonder. We get enough time apart to miss each other a little bit, and it breaks our routine just enough we take each other a bit less for granted. Folks at my office teased me that the “honeymoon must be over” since I didn’t rush home to greet him the moment his flight landed. He has always traveled for work, now less so than previously, but a week apart is normal enough for us. In fact, we both kind of like the first few days. It’s hard to explain, but for the two of us, that little distance is entirely required to maintain our equilibrium between independent and partnered, the rhythm of cyclic downtime and togetherness.